We’re in the thick of the high holidays now. Rosh Hashanah is behind us (hope you had a good one! ), Yom Kippur is awaiting us, and we find ourselves in the Aseres Yemei Teshuvah, the Ten Days of Repentance. Some of us may even be fasting today, since it’s Tzom Gedalia. This is the time of year where it’s customary to think about our actions. How can we improve ourselves, and how can we strengthen our connection to our Creator? It’s a heady, intense time. I like it. When I finally get into the Tishrei frame of mind, I like how much more the Torah is at the forefront of my thoughts, how I’m looking for mitzvos everywhere I go, and how I see hashgacha pratis (Divine intervention) much more often. Just this Shabbos, we had a great hashgacha experience, and I wanted to share it with you. When Rosh Hashanah falls out back-to-back with Shabbos, we have what is called a “three-day yom tov.” That means three days of no internet, no phone calls, no running to the store to get Cheerios because you’re almost out. It’s three days of being off the regular grid and on the holy grid. With my little kids, I have to get creative sometimes with how to keep them from maiming each other entertained. Near our new house, there’s a shul with a playground that is accessible to the public. It’s just a little playground with a couple of slides and a little wooden house, but it’s enough to keep my little people to be happy for a short period of time. Friday morning, we availed ourselves of this resource, and I even ran into an acquaintance while there, an unexpected treat. It wasn’t until much later that evening, when it was time to put the baby to sleep, that I realized her stuffed lion was nowhere to be found. Now, not being able to find something in our house has, unfortunately, become the norm. We moved less than two months ago, and I’ve been home with the kids all day or preparing for the holidays most of that time. So, unpacking? Yeah, not so much. I’m happy we’re functioning as well as we are. I did my best to comfort her, but she was still not the happiest of babies to have to go to sleep without her favorite toy. After she was finally sleeping, I searched the house, looking under, over, behind, whatever. No lion. This was bad. I had a vague recollection of her bringing the lion with us to the playground. The situation then escalated from bad to worse. 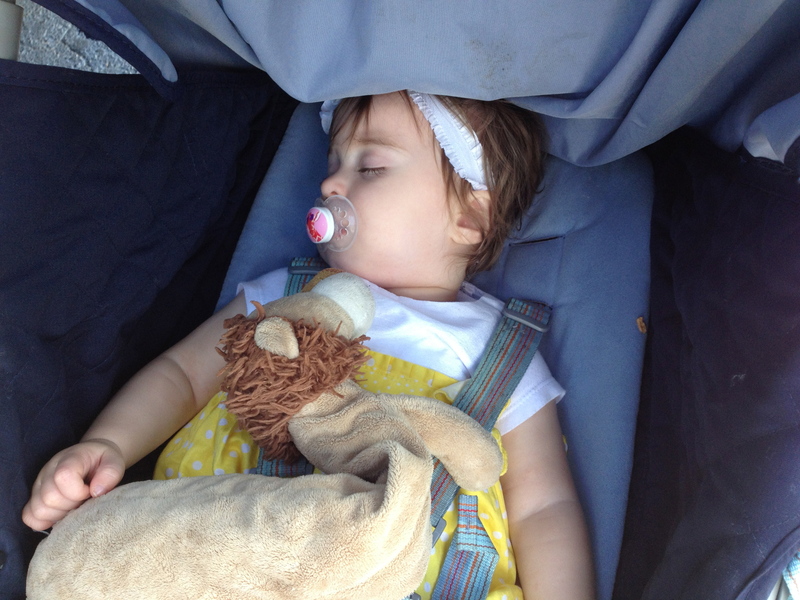 I had a feeling lion had been chucked overboard from the stroller at some point on our way home. This lion was a gift from my mother-in-law, and I had no idea where to find another one. Also, all the stuffing had been hugged out of his neck, resulting in a distinctive slouch. I wouldn’t know how to exactly replicate that, save for squeezing him a lot, which would just feel kind of weird (but, you know, the things we do for our children…). Since there was nothing to do about it at the time, I put the matter aside. We did one of these mitzvos on Shabbos when we had over some close friends for lunch. Whenever we have guests that are enjoyable, I’ve always considered that a benefit in this world. Good company, nice conversation, stimulation for the kiddos. Yes, please, I’ll have more of that. The meal was pleasant, as expected, and my boys enjoyed walking our guests out, which is considered a part of the mitzvah. Of course, that my boys were yelling at the guests, “DON’T GO YET! DON’T GO! STOP! WE WANT TO WALK YOU OUT,” was not so much the way I would advise doing the mitzvah, but thankfully, our friends were understanding. My curiosity piqued, I hurried outside to see who our visitor was. Was it a neighbor? A playdate? No, it was our Shabbos guests. Hmmm. And then my husband told me to look at the baby. On their walk home, our friends had come across the missing toy! He had been laying forlornly on the side of a busy road. 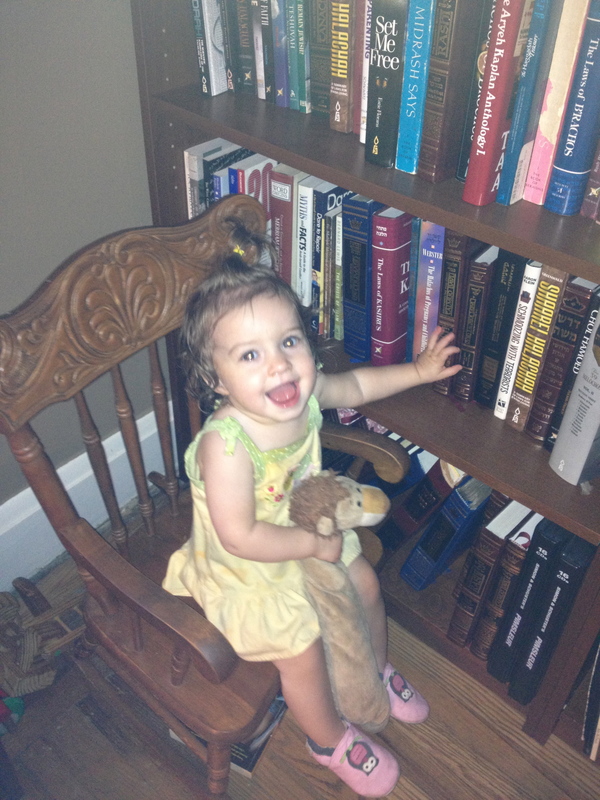 The baby was thrilled to be reunited with her favorite toy, and proceeded to hug more stuffing out of him. We took this opportunity to tell our children how, sometimes, when you do a mitzvah (having guests), you get an immediate reward (finding lion!). My four-year-old pointed out that our guests got to do a mitzvah, too! The mitzvah of returning a lost object. Mitzvos all around! And I took to opportunity to tell myself that every mitzvah, no matter how small, can have a positive effect and sometimes, a tangible benefit. Previous Post Little Kids Eating Healthy? You Bet. I love this so much! And I know more than anyone right now that the smallest gesture done with good intention is always holy. So glad Lion found his way home. You live in a great place. Happy New Year. I hope that your life is chock full of such gestures. Like a burst of good intentions making everything beautiful. This is such a delicious post!!!! It brings back the sad feelings…and then the happy ending.. that the entire family felt when any of our sons lost (and then found!) his favorite blankie or stuffed animal!! Yay!! Thank G-d!!!! Thanks! It is always a bit of a desperate situation when a precious object is lost! Great post for the Aseret Yemei Teshuva! we have a curious george who is no longer curious—– VERY MAULED NOSE. At almost age 7, my kiddo STILL chews that stinky nose DAILY. I can’t tell you how many times he’s tossed it on the ground and people have run after us to return the beloved monkey. I bought a second one so that he wouldn’t notice when George was in the laundry— it backfired and now he has “George 1 and George 2”. George 2 NEVER gets chewed, so you can tell them apart EASILY. Exactly. After a while, these loved objects become irreplaceable. The lion reminds me of a teddy bear I had when i was little. I loved him very much and regularly tore a hole into the region of his neck, so that his head was somewhat – unstable. :-) When my mum fixed that one night and I found him in the morning, I said (so I’m told) “hey, what’s that, he can’t say “No” any longer” and started turning his head until there finally was a hole again. BTT: Good deeds are always rewarded, I’m sure. If you connect to the positive spirit in the universe, you’re bound get more positive things in your life as well. Yeah, the squeezing I was envisioning was more like throttling. Not a warm and fuzzy kind of squeezing. Very cute story about the teddy bear! Such a difference between the opinions of adults and children about what’s desirable! Indeed! I’ve no idea, though, why I found it important for a teddy bear to say “No”.